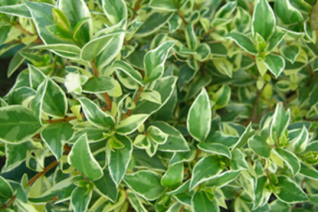 Dapper clean evergreen shrub for full hot sun and poor well drained soils. 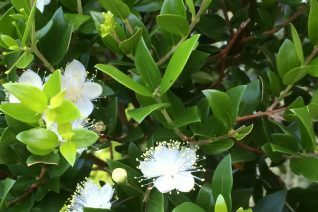 This cold hardy selection of Sweet Myrtle has endured temperatures to 5ºF once established. Formal looking evergreen with sweetly fragrant foliage when disturbed. 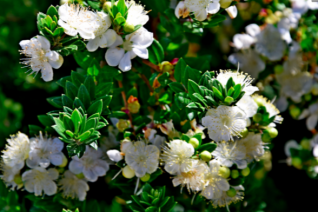 In summer to early autumn simple white flowers with a protruding showy boss of white stamens appear like little bouquets followed by elongated black berries. Incredibly drought and heat tolerant. Protect from subfreezing east wind. Takes west aspects that are blasting hot – all day or just for part of the day. Not often seen for sale this form grows moderately slowly to 3′ x 3′ in 6 years. Takes very well to pruning which should only be done in late spring. Moderately deer resistant. Little water when established, light irrigation speeds growth.